First of all: Sad Girl Cinema is a work in progress. What aired at SQIFF was what the collective has created so far, including never-seen before footage: so far, so good. 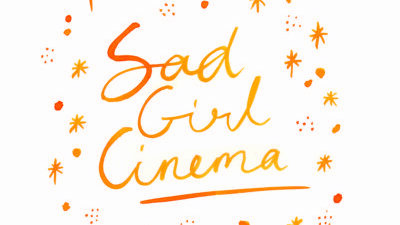 Sad Girl Cinema is a project combining experiences of mental health and illness with pop culture, with its end result being a documentary exploring three chapters: therapy on screen; the mental health ward on screen; tortured geniuses and tragic muses on screen. In this instance, the screening opens and closes with two chapters of the ongoing project. Cinema is interweaved with experiences made even more personal with voiceovers reading essays, linking criticism with the document presented. The evening opened with ‘I’m too poor to be one of the Girlfriends’ by Imade Nibokun: this essay is read alongside scenes from American sitcom Girlfriends. For Nibokun, Girlfriends was the first depiction of therapy on-screen she could relate to, criticizing previous depictions as only involving white women. However, this essay analyses the intersections of illness: Nibokun reveals her background as a Black woman in poverty, and as scenes from the comedy appear visually, we hear first-hand stories of being suicidal while living on the bread line. The documentary closes with chapter ‘Queer in the Psych Ward’ by Lisa Ruiz. Ruiz’s story revolves around the story of Lana Winters in American Horror Story: Asylum, specifically in context of Sister Jude’s remark that ‘mental illness is the fashionable explanation for sin.’ Ruiz talks about her background of both sexual and psychiatric abuse, and how religion has impacted her access to support as a queer person with a mental illness. Ruiz comments on the pathologizing of queerness – one part of the essay reflects on abuse and dismissal of identity – and experiences of homophobia while institutionalized. This links us back to the context of the film festival, as well as the recurring issue of intersectionality: a theory at the heart of the project, ensuring that otherwise ignored voices are amplified. Between these are more examples of mental illness on the screen, small and big alike, from the cringe-worthy to the downright offensive. These include: a scene between a gay teenage boy and his therapist from drama In Treatment, as his therapist seeks to answer his behaviour; an episode of The Simpsons, where Homer’s uniform transgression leads to him being deemed ‘insane’; a scene from It’s Kind of a Funny Story, where somewhat average teenage boy meets manic pixie dream girl (with added mental illness); the music video to *NSYNC’s 90s bop Thinking of You (I Drive Myself Crazy), in which Justin Timberlake’s noodle head is locked in a padded room following a break up. As we are not presented with a commentary to these examples, the audience is encouraged to interact, both at the time and through discussion afterwards. While individually the selection seems bizarre, it seeks to categorize what we truly can call ‘sad girl cinema’. The project achieves its aims of self-advocacy through its presentation of media without comment: the audience is invited to project its collective stories and experiences to the sub-par representation in the media. Yes, we reflect on what’s presented – and how good or bad a representation it offers – but this in turn allows us to envision a cinema, and a society and healthcare model, where our experiences and intersections are not only respected, but central to our care.